Sponsored by Trusted Health and Hosted by Mom Does Reviews and her fabulous blogger friends. What is Beautiful am Moisturizer? Did you know that there is a men’s line of this skin care system – You’re the Man – is available as well? Be sure to sign up for the Natural Health Blog and Newsletter. Please read Mom Does Reviews full Review of “Beautiful Pam” am and pm skin care system. The participating bloggers were not compensated for this post. We are not associated with any of the companies named above. No purchase is necessary to enter. Void where prohibited by law. The odds of winning are based on the number of entries received Open to the Continental US and Canada 18+ only. Confirmed Winner(s) (by Random.org) will be contacted by email. Winner(s) have 24 hours to respond before a new winner is chosen. No purchase necessary. Void where prohibited by law. The sponsor(s) will be responsible for product shipment to winner(s) of this giveaway. My blog is not responsible for product shipment/delivery. This event is in no way administered, sponsored, or endorsed by, or associated with, Facebook and/or Twitter, Google, Pinterest, Instagram or Klout. This disclosure is done in accordance with the Federal Trade Commission 10 CFR, Part 255 Guides Concerning the Use of Endorsements. Entrants must only enter with either one email address, IP address and/or Facebook account, anyone found violating these rules will be disqualified. It is at the sole discretion of the admin of the giveaway if the winner has met the rules or not. I like that because I have sensitive skin. I would love to try this new product. I would like to try Beautiful am for beautiful, younger-looking skin. I like trying new natural skin care items. I don’t like to use harsh products on my face. I’m always looking for natural options to try and this sounds good, would like to try it! It’s all natural and can work on my combination skin. 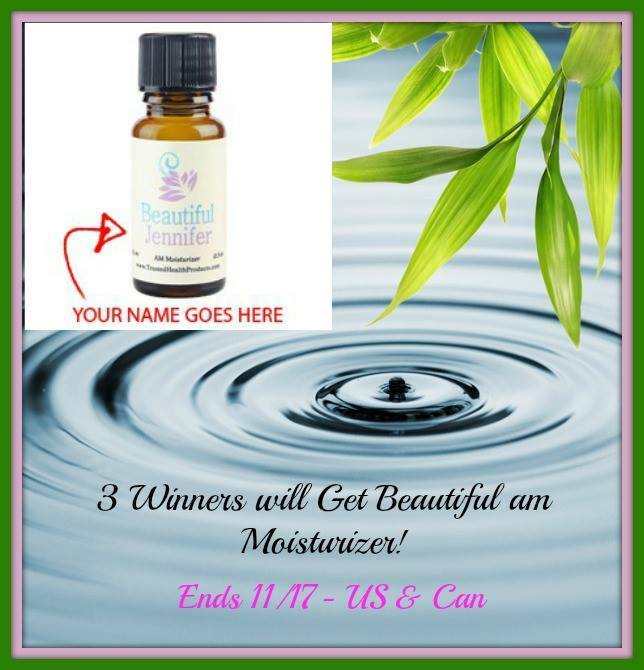 I am a huge fan of Trusted Health products, and I would love to win this product I haven’t tried yet. I would like to try this be because I have been on the look out for so long for a product that will help with acne and aging in one, I have tried so many products and would love to give this one a try! I like trying new products and this looks great! Thanks for the chance to win it! I like that its natural and does the work of more than one product. I bought some for my daughter and it has really helped her skin! I would love to see what it does for me! I would love to try this because I am looking for a product to help with fine lines. I like that it’s an all in one product. Because it seems to be a awesome product. I need a product that really works ! I would like to try it because it is 100% natural. I’m always looking for an all natural skin care solution that is beneficial to my skin. I have used different natural products and I love the results. I would love to try this, because it is chemical free. It has to be good for your skin, read the ingredients. I just turned 40 and I would like to find a skin care regimen that will keep my skin looking healthy. I like that it is for all skin types. I love that it’s 100% pure and is an All-In-One skincare product! I hate having to use several different things on my skin! I love trying good quality skin care products and I love the personalization on this product! I am always looking for new lotions/creams to try! I am very picky about it because of Sensory issues.. once i find something I like it super excites me!! !